The name "temporal logic" may sound complex and daunting; but while they describe potentially complex scenarios, temporal logics are often based on a few simple, and fundamental, concepts - highlighted in this book. 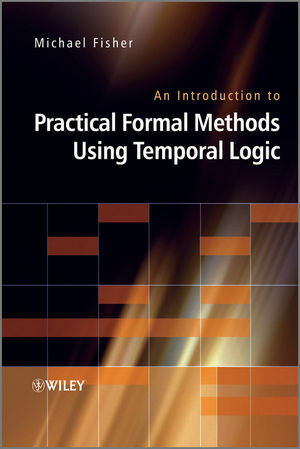 An Introduction to Practical Formal Methods Using Temporal Logic provides an introduction to formal methods based on temporal logic, for developing and testing complex computational systems. These methods are supported by many well-developed tools, techniques and results that can be applied to a wide range of systems. Fisher begins with a full introduction to the subject, covering the basics of temporal logic and using a variety of examples, exercises and pointers to more advanced work to help clarify and illustrate the topics discussed. He goes on to describe how this logic can be used to specify a variety of computational systems, looking at issues of linking specifications, concurrency, communication and composition ability. He then analyses temporal specification techniques such as deductive verification, algorithmic verification, and direct execution to develop and verify computational systems. The final chapter on case studies analyses the potential problems that can occur in a range of engineering applications in the areas of robotics, railway signalling, hardware design, ubiquitous computing, intelligent agents, and information security, and explains how temporal logic can improve their accuracy and reliability. Presents exercises and pointers to further study in each chapter, as well as an accompanying website providing links to additional systems based upon temporal logic as well as additional material related to the book. Michael Fisher is currently Professor of Computer Science at the University of Liverpool. He also heads the Logic and Computation research group and is Director of the Liverpool Verification Laboratory. Having been an active member of the research community for over 20 years, Professor Fisher is internationally recognised for his research into logic and computer science, particularly temporal verification, automated reasoning, high-level programming languages and formal methods for multi-agent systems. This has also led him to be programme chair of the International Symposium on Temporal Representation and Reasoning in 2004, and a member of the steering committee for this event. He has co-edited several books, including Advances in Temporal Logic (Kluwer, 2000), Foundations and Applications of Multi-Agent Systems (Springer-Verlag, 2002), Temporal Representation and Reasoning (IEEE Computer Society Press, 2002) and Handbook of Temporal Reasoning in Artificial Intelligence (Elsevier, 2005).